This morning Future Music Festival announced that Bloc Party will be performing three additional sideshows while they are in Australia. Bloc Party will play in Brisbane, Sydney and Melbourne, finally giving fans a chance to see the band in all their glory since only playing one sideshow for Splendour in the Grass last year. This entry was posted in Festivals, HOT!, Music, Upcoming events and tagged australia, Bloc Party, brisbane, Festival Hall, Four, future, Future Music Festival., Hordern Pavilion, melbourne, sideshow, sydney, The Riverstage, tour, Truth on January 21, 2013 by bppdjcentral. 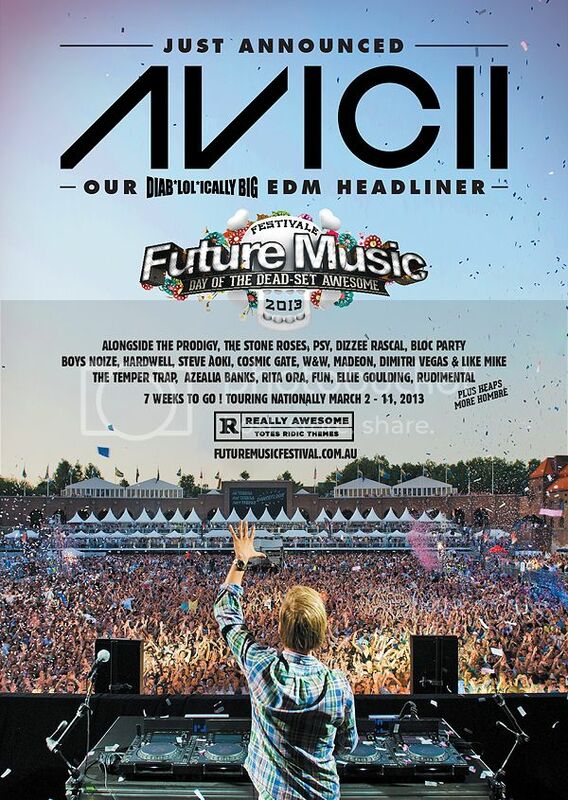 Avicii Announced as Future Music Festival’s EDM Headliner! Australian music festival lineup are continuing to grow bigger and better. Proving this, Future Music Festival announced this that Avicii has joined Future Music Festival‘s already massive lineup as their EDM headliner. Avicii joins the likes of The Prodigy, Boys Noize, Dizzee Rascall, Rita Ora, Hardwell, Madeon, Steve Aoki, Alesso, Nervo, Kill The Noise plus loads more!! Avicii only just toured Australia with Stereosonic at the end of last year but no one will be complaining to have him back in March! With less than seven weeks to go I’m sure that we aren’t the only ones counting down until we get to see Avicii again! If you live around Brisbane, Sydney, Adelaide, Melbourne or Perth and don’t already have tickets, sort them out because Future is going to be a day you will not want to miss!! This entry was posted in DJs, Festivals, HOT!, Music, NEW!, Upcoming events and tagged adelaide, Alesso, australia, avicii, Boys Noize, brisbane, Dizzee Rascall, EDM, Electronic Dance Music, festival, future, Future Music Festival., hardwell, Kill The Noise, lineup, madeon, melbourne, nervo, perth, Rita Ora, steve aoki, sydney, The Prodigy on January 19, 2013 by bppdjcentral. Ultra Music Festival in Europe! Ultra Worldwide has just announced that they will be bringing their prestigious festival to Europe for the first time in 2013 from July 12th – 14th in Croatia. The festival plans to span 2 separate venues – spending its first 2 days at Poljud Stadium before moving to the Hotel Amfora Grand Beach Resort on the island of Hvar. This is exciting news for European dance music fans, but it remains to be seen if a Miami Music Week type of following, with its week long party schedule, will be established in it’s inaugural year. Priced at 40 euros (approximately $65 USD), early bird tickets for the first two days go on sale December 5th exclusively at Ultra Europe.com. Stayed tuned for the Phase One lineup announcement on December 12th at 12:00 p.m. local time. Also, for those of us stuck in the states, there are already extensive plans to stream the event through UMF TV and UMF Radio. It will be Swedish House Mafia’s final performances at Ultra Music Festival. Be sure to grab a ticket to get in quick! This entry was posted in DJs, HOT!, Music, NEW!, Upcoming events and tagged 2012, 2013, announced, buy, concert, dance music fans, december, entertainment, euro, europe, european dance music, event, festival, future, gig, house, line-up, lineup, live, mafia, Music, purchase, swedish, tickets, ticks, tix, ultra, upcoming, worldwide on November 29, 2012 by bppdjcentral. From its humble beginnings back in 2006 at Sydney’s Randwick Racecourse, Future Music Festival has morphed into a colossal beast of an event, touring the country in March. This over 18years old event is set to pop off, with the line up already announced and tickets are now for sale. Tickets for the event can be found on Moshtix website here^, just click the city event you wish to attend and click purchase. Boys Noize (Live debut) – Hardwell – The Temper Trap – FUN. If you and your friends are heading to the event let us know by leaving a comment! We like to know who you are looking forward to see at Future Music Festival and which event you are actually attending! Thanks guys and we will see you all there! This entry was posted in DJs, HOT!, Music, NEW!, Upcoming events and tagged 2013, a-trak, adelaide, aoki, azealia, banks, bloc, bombs away, borgore, boys, brisbane, brothers, cat, cocoon, day, dead, dizzee, DJ, ellie, entertainment, event, feat, features, featuring, feed, festival, fresh, FUN, future, gig, goulding, guest, gypsy, hardwell, hawtin, heroes, kill, labour, live, long, lowe, madeom, magda, me, mind, more, Music, nervo, noize, ora, Party, performance, perth, prodigy, psy, rascal, ricardo, richie, rita, rudimental, seth, special, stafford, steve, stone roses, sydney, temper, tenzin, timmy, trap, troxlet, trumpet, upcoming, villalobos, wake, weekend, your, zane, zeds on November 21, 2012 by bppdjcentral. This entry was posted in NEW! and tagged clip, english, entertainment, future, future music, futuremusic, gungnam, gungnam style, live, Music, new release, news, perform, performing, psy, release, song, style, video, YouTube on October 24, 2012 by bppdjcentral.